How To Select A Waterproof GPS Running Watch. IPX6, IPX7, or IPX8? I am looking to purchase a waterproof GPS running watch. I also occasionally do triathlons and need a GPS watch that has a waterproof rating that will support swimming, yet versatile enough to train during long runs. I see running watches that have various IPX ratings. What exactly do these mean and how do I know my watch complies with this rating? First, thank you for the question. As you mentioned, IPX is just a rating standard that distinguishes the level of water proof capability a watch has. I describe the standards below, but I also want to put the IPX6, IPX7 and IPX8 into perspective in terms of what that means for a runner or triathlete. Generally speaking, a water resistant watch is OK for running and this will be the IPX6 or IPX7 rated watches. These watches will protect against rain, and short periods of time immersed under water. While IPX7 rated watches are rated to protect immersion up to one meter and up to 30 minute, it is highly recommended to not take that chance and go with the higher rated IPX8 watch. Note: Some links on this page go to Amazon.com. You are certainly under no obligation to buy from them. I include them so you can see the watch, read the reviews, see additional product specs and make an informed decision. Should you decide to purchase, I may receive a very small advertising commission, but there is never any extra cost to you. Water proof watches will hold up to much longer periods of immersion and are recommended if you like to do triathlons, or swim as a cross training activity. I have two recommendations beyond the Fenix 3 and 5 I mentioned above. They are the Garmin 735XT and Garmin 935 Multi-sport watches. They are the gold standard of triathlon/multi-sport/running watches. Protected against heavy splashing and rain. Must not fail or show water seepage when exposed, but not when immersed. Protected against short durations of water immersion. Max immersion for less than 30 minutes and at a depth of less than 1 meter. 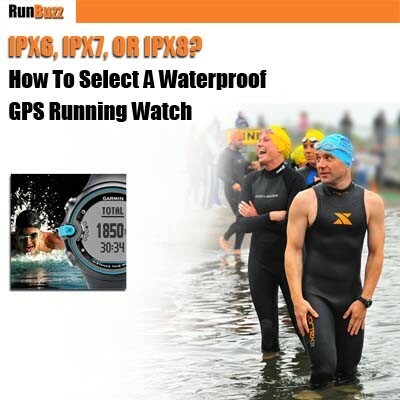 IPX-7, while water resistant, is still not recommended for swimmers, as a precaution. Designed for continuous underwater use. The best rating for sport/GPS watches used for swimming. If you want to see a side by side comparison of several Garmin running watch features, check out my Garmin GPS Comparison Chart. Want to put your watch to great use? Check out our PaceBuilder’s Training Program. Our PaceBuilder’s VIP training program goes above and beyond your basic training plan. We give you access to training plans for any race distance along with runner-specific strength training programs, exercise video libraries and coaching guidance in areas of nutrition, injury prevention, pacing, and more. We even come with a client-only community and LIVE coaching Q&A calls each month. Or upgrade and get 1:1 coaching added as part of our PaceBuilders ELITE upgrade.